Do Antibiotics Mess With Your Birth Control or What? Plenty of people have horror stories about their friend's cousin's girlfriend's sister who got pregnant even though she was taking the pill. That's scary, mostly because people on birth control are trying to, you know, NOT get pregnant. There are myriad rumors about why this happens, but one of the most persistent is that antibiotics can interfere with the intended effects of hormonal birth control. Is there any truth to this urban legend? Can you really get pregnant while taking antibiotics at the same time as birth control? 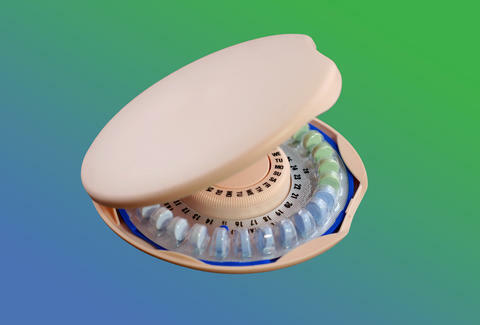 But Dr. Kimberly Jean, a board-certified physician who focuses on reproductive health, notes that there's one particular antibiotic that will interfere with the pill's effectiveness. This antibiotic is known as rifampin (or Rifadin), a member of a class of drugs called antimycobacterials. Predictably, these drugs fight mycobacteria, most notable for causing tuberculosis and leprosy. According to Dr. Jean, this class of antibiotics causes estrogen to be metabolized and broken down fairly quickly in the liver. As a result, estrogen levels plummet. When this happens, as Dr. Monya De, MD MPH, puts it, "No estrogen, no stopping of ovulation." Since birth control prevents your body from ovulating, and therefore from giving a determined sperm the chance to connect with an egg, the normally slim chance of becoming pregnant turns into a real possibility. Dr. Jean also mentions that the US Medical Eligibility Criteria for Contraceptive Use "does not recommend the use of birth control pills with antifungals… which are not synonymous with antibiotics." You'll want to watch out for griseofulvin specifically, which is used to treat ringworm and nail fungus. Since you may not have a degree from pharmacology school, it's always a smart idea to tell your doctor straight up about what kind of birth control you're on (really any drug you're taking is good information to share). Then you can both discuss options for a prescription that won't cancel out your decision to control the baby population. What else can weaken your birth control's effectiveness? If you thought drugs were your only concern, you have yet to come to terms with the full power of the human body and mind. Planned Parenthood says there are other factors that also have the potential to cancel out your birth control. What's even worse is that most of them fall under your realm of responsibility. First, if you end up throwing up or having diarrhea within two hours of taking your birth control, you probably haven't actually absorbed enough of the pill for it to be effective. Makes sense, but it may not be something you consider as you're hurling into a trash can. In this case, a backup method must be used or you'll be suffering from morning sickness next time you face ride the porcelain throne. Planned Parenthood also says that "the pill may be slightly less effective for women who are very overweight." While preliminary research suggests there's not a strong association between weight and birth control effectiveness, it's still best that you speak with your doc to see if you may be at risk for an unplanned pregnancy. This should come as no surprise, but human error is the most common reason birth control fails. According to Planned Parenthood, "9 out of 100 women get pregnant each year if they don't always take the pill as directed," which is a frighteningly high number if you think about all the women you know. On top of that, PP continues, "Combination pills work best when taken every day. Progestin-only pills must be taken at the same time every day." So if you're someone who doesn't like to play by the rules, you may want to reconsider when it comes to oral contraceptive. If you don't follow your birth control directions to a T, they're not guaranteed to work. Same goes for forgetting to take them at the same time every day, or forgetting to take them completely, though if that happens you probably don't expect them to work at all. Though antibiotics have likely been blamed for many an unplanned pregnancy, following your pill's instructions and triple-checking any medications you plan to take alongside your birth control can keep yourself free of diaper duty. Devan Ciccarelli is a writer and marketing specialist who doesn't f*ck around with the rules of the birth control gods. If you share the same fear, follow her on Twitter: @DevanCiccarelli.